When I break down the Assault Rifle in Halo (which we’ve already discussed as “missing something” for me), I find the muzzle flash itself to be fairly fine. The weapon has a fairly large bulk that covers a chunk of the screen, so the bright, star-shaped muzzle flash does the job well. The muted firing sound is a disappointment however, evoking more of an electric typewriter than Hicks and Vasquez cutting loose. The environment impact effects are very small pockmarks and tiny sparks, although kudos to them for portraying bullets ricochet in random directions afterwards. The enemy impacts are nearly nonexistent, however. The opponents do have a satisfying animated hit reaction when struck, but rarely do I see where I hit them. 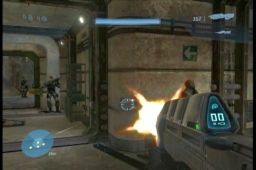 In general, the Assault Rifle is more effective than it was in previous Halo installments, it still is almost useless unless you are fairly close to your opponent and tends to be skipped over when choosing a weapon loadout. 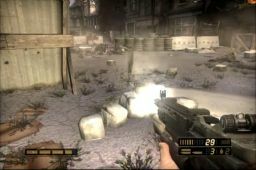 The M5A2 Carbine in Resistance is the player’s starting weapon, and definitely sees more use than the Halo rifle over the course of the game. This weapon has a nice, bright muzzle flash and a distinct screen shake when the weapon is fired. The sound effect is sharp with a nice echo and seems nicely realistic (in a “WWII movie” sort of way) to contrast with some of the more unusual weapons provided later on in the game. The environment impacts are certainly more prominent than Halo’s, with a high, vertical gout of dirt, although it’s pretty subtle when striking harder surfaces. When hitting an enemy, the dark sprays of blood provide okay feedback, although sometimes it’s hard to tell if you are significantly damaging one of the grunts. This can be a pain because the weapon seems volatile in its effectiveness. Sometimes a few shots do the trick and cut a hose on a foe, but sometimes they just won’t freakin’ die. Perhaps this is to cement the fact that the soldiers are vastly outgunned in this war, but there are too few weapons (and the Carbine shows up too often) to make this point at the cost of fun gameplay. 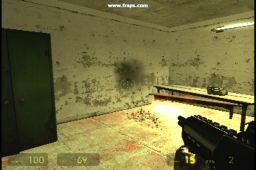 For an automatic weapon, the SMG from Half-Life 2 is a bit different than the others but it fits the bill because it is so frequently used. Once again, the weapon has a fairly subtle muzzle flash that isn’t the white hot light of a dozen suns, but it lets the firing rate and the vibration of the weapon do the talking. 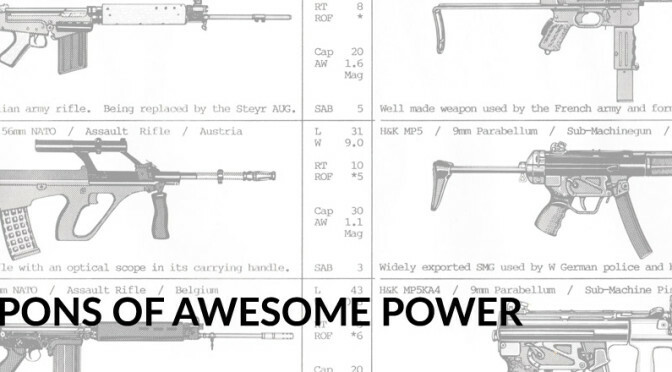 It unloads a ton of bullets, more than any other gun on this list, with a throaty chattering sound that blends individual shots into an intimidating roar. The impacts are once again dusty with little physics-driven wall “bits”, but the sheer quantity generated by the rate of fire of this weapon makes it fairly impressive and not too over-the-top. The blood spray from impacts is subtle again, although Valve made the blow-through extremely visible if the enemy is against a wall. The enemies don’t twitch too much when hit by this weapon, but this definitely feels like a precision weapon, so perhaps I don’t feel the need for as much validation of my hits. Overall it feels and plays like a deadly implement. 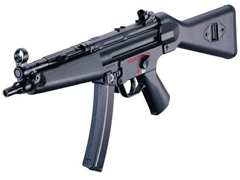 This weapon is a workhorse in Q4’s arsenal. Its firing effects aren’t too prominent, with the muzzle flash lasting only a frame or two, making individual shots more of a flicker or flash and making the weapon vibration and environment lighting carry the sense of power. 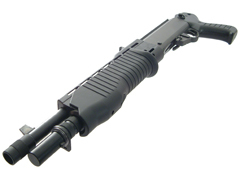 The sound is extremely staccato, like the “realistic” Carbine in Resistance, but even more “nail-gun-like” because it is clearly made up of individual short gunshot sounds, unlike the Half-Life 2 SMG that blends them together. The impact effects are good, however, with large sparks cascading from the point of impact. Since the environment is mostly metal, the impact decals are fairly small and don’t leave a lot of evidence of the player’s action. Hitting an enemy spouts a misty spray of blood that is sometimes visible but can be missed, and as with many other games, the opponents don’t always hit react… This is generally for gameplay purposes so that the player does not excessive interrupt the enemy’s ability to fight back, but it definitely can lead to weaker feedback. 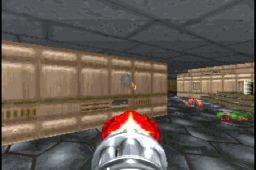 The minigun in Doom is the closest comparison to an automatic rifle for this category. The firing effects are fairly simple again with a hand-drawn flare and a slight environment lighting flicker. 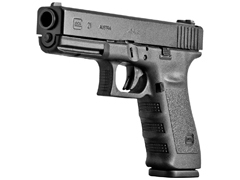 Otherwise, this weapon is basically a fast-firing pistol. Actually it literally is, using the same sound, impact, damage effects, and (if I recall correctly) the exact same projectile code as the pistol, so most of the pistol feedback applies. 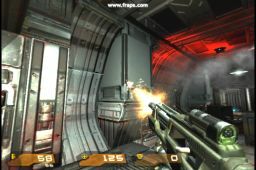 In terms of effectiveness, the weapon is all about peppering your enemies with dozens of pistol shots, making it effective at killing the masses of low-level enemies that is a staple of Doom gameplay. In addition, it carries a second role is locking down more beefy enemies like the Cacodemon, who gets caught in a “dance” of hit reaction animations while the player keeps firing. 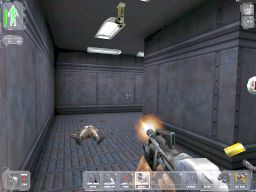 As with the pistol in Deus Ex, the muzzle flash for the assault rifle is a simple flat sprite that doesn’t have much motion and is slightly transparent, meaning that it doesn’t look “hot” enough. The firing sound effects are also fairly low-key, leading to less of a sense of power, which is surprising given the massive sounds generated from the pistol and shotgun. There is nearly no impact effect from using this weapon, on either the environment or an opponent… the enemies in particular do not hit react much at all from impacts. This is likely to avoid the “hit react dance” that lock down opponents in games like Doom, but the weapon is generally inaccurate enough at the start of the game that players can get frustrated after acquiring what they thought would be an awesome weapon. Early in the game, the best way to get kills is to fire up the body and go for the headshot. With the Thompson SMG, Bioshock once again delivers a nice sense of power in their weapon effects. The weapon’s muzzle flash is white-hot and the gun’s high rate-of-fire as well as the huge shells ejecting in all directions provides some very gratifying feedback. The sound is nice and staccato, but it also has a verylong echo that helps blend the individual shots together, although a bit less than Half Life 2’s SMG. 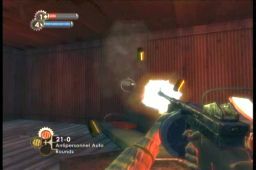 Each bullet’s impact on the environment is again very good, spouting an excessive amount of dust and sparks, and hits on enemies once again presents a prominent splash of blood that gives a tremendous sense of reward for being on target. Overall this weapon feels very good to wield. What about the fearsome submarine guns from middle school? Hahaha! And the heavy-duty autocratic!